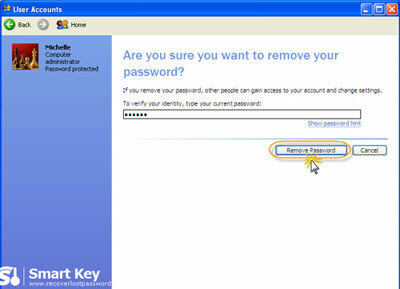 Creating Windows XP password is really a good habit to prevent your privacy from spying eyes. But if you find that you have serious problem remembering Windows password or you are the only user with access to your computer. You had better to remove Windows XP password to completely bypass the logon process. There are two scenarios in which you may need to remove XP password. 1.Click on "Start"->"Control Panel"->"User Accounts". 2. 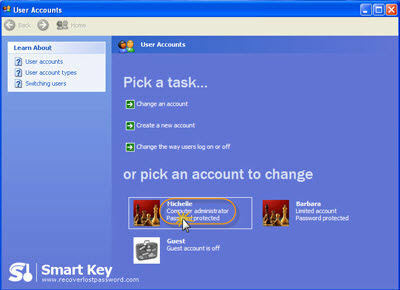 In the "pick an account to change" area of the "User Accounts" Window, click on your Windows XP user account. 3. Select "Remove my password", and enter your current password in the text box on the next screen. 4. Click on "Remove password" to confirm your action. Now, you have removed your Windows XP account password. You will no longer need to log on to system with the password. If you have already forgotten Windows password and can't access to system, you need to remove windows XP password with the help of the third party program. 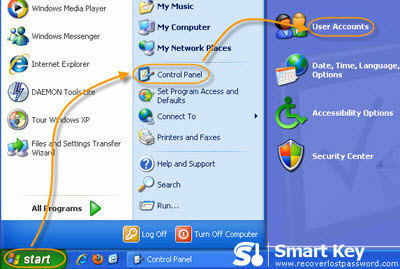 Windows XP password Remover is widely used by thousands of users around the world to remove XP password. Below is the easy step on how to operate it. Step 1: Here we need another computer to burn password reset disk. Insert a blank CD on this PC, and launch Windows XP Password Recovery. Step 2: Select "reset Windows local account password", and tick "CD/DVD" and choose your target device. Step 3: Click "burn" to start the Windows XP password reset disk creation. 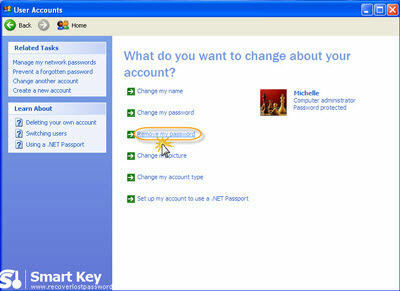 Step 5: Select the user account you would like to reset password for and click on "Reset". And then "Yes" and "OK" when two indicators show. The last step you need to do is to reboot your PC to finish the reset. Note: Any way, while it is not a secure practice, you can remove Windows XP password. How to Change Administrative Password in Win XP? How to Crack Windows XP user Account Password? 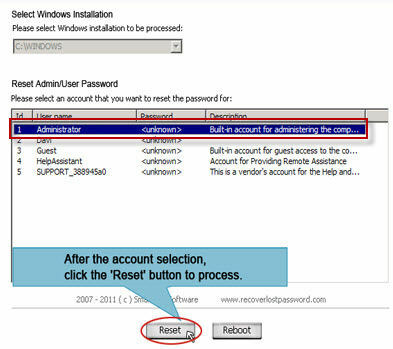 How to Reset Windows XP Password?